Utilizing three layers of supporting, cooling, and contouring foam, Eve Mattress promises to deliver online-only convenience, comfort, and affordable prices. After creating 70,000 prototypes over the course of four years, Eve Mattress tells us they’ve developed a unique layering system and “new generation” memory foam that delivers a balance of comfort, coolness, durability, and bounce—all at an affordable price. While Eve claims their UK-manufactured mattresses are made of the highest quality materials, they’re sold direct, allowing the company to cut out the middlemen and pass the savings along to customers. Like many other online-only mattress companies (more soon), Eve ships straight to your doorstep, compressed and rolled in a vacuum-sealed box. This means it’s easier to maneuver into your bedroom, where you simply have to unwrap and watch it take shape over the course of a few hours. Together, Eve tells us they’ve sold more than 34,000 mattresses to date. Will you be next? Are they really “the world’s most comfortable”? Are they anything “revolutionary”? Here, we’ll explore Eve’s mattresses, what they cost, how they stack up against the competition, and many other important factors that can help you make a more informed purchase. What Are the Specifications for Eve’s Mattresses? Although it comes in different sizes, Eve manufactures only one mattress model; a 3-layer foam design surrounded by a fabric cover. The company describes Eve as medium firm, although we’re told their “unique layering system” delivers the support of a firm mattress with a softer top for a more balanced feel. As such, they claim it’s ideal for all sleeping positions. According to the company, compared to traditional memory foam, Eve is extremely breathable to keep you cool all night and won’t make you feel like you’re trapped in bed. It can be used on all bed bases, or even on the floor. From a quality perspective, all the materials used in Eve mattresses are inspected by CertiPUR and certified as 100% safe, with no harmful chemicals. Eve also extensively compress-tested their mattress by simulating 10 years of wear, and that, “under normal usage your mattress would indent an average of only 2mm.” This is compared to a traditional spring mattress that would indent 20mm. Now, let’s talk about each of those layers. Located above Eve’s supportive base layer is 1.5” of cooling foam that’s made using open-pore technology, which the company claims is 30% more breathable than conventional memory foam. This way, it can help better regulate your body temperature throughout the night, helping you wake up feeling refreshed. On top of the cooling layer, you’ll find 2” of responsive “new generation” memory that combines the advantages of bouncy materials, along with those of conventional memory foam. This means its high point elasticity will contour to your body and redistribute pressure to relieve joints—no matter how you sleep—without the excessive sink. Surrounding these three foam layers is Eve’s knitted cover, crafted from delicate and soft two-way stretch polyester. Its fine-mesh weave is hypoallergenic and designed to stand up to regular use, without “losing its sparkle,” while also adjusting perfectly to the memory foam underneath. One the sides, Eve’s cover is accentuated with yellow fabric that delivers “unique airflow qualities,” along with a mesh spacer to help circulate air while you sleep. Finally, Eve’s cover is Oeko-Tex Class 1 certified to be free of harmful or unpleasant substances. Also made of premium memory foam, Eve’s pillow measures 16.5” x 26” x 4.3” and weighs about 3.75 pounds. The company tells us it features the same medium-firm feel of their mattresses, which provides plenty of pressure relief. Surrounding this memory foam is a soft cover made of durable knitted polyester fabric that’s soft to the touch and provides “lovely elasticity,” similar to your favorite t-shirt. Compared to the competition, Eve tells us their pillows are treated with Ultra Fresh, an additive that makes the foam hypoallergenic and protects against bacteria, mold, mildew, and dust mites. How much do Eve’s bedding products cost? How Much Does an Eve Mattress Cost? What’s The Return Policy? Regardless of which option you choose, your order will be shipped within 48 hours at no charge. All trials/returns include free shipping, although if you accidentally ordered the wrong size and needed to process an exchange, you’ll be responsible for a $50 S&H fee. Exchanges also void the 100-night trial. To request a return or exchange, you’ll need to reach out to Eve’s “top rated, San Francisco-based customer service team” at 800-383-3994 or hello@evemattresss.com. By partnering with Affirm, Eve offers interest-free credit on mattress and pillow purchases, which you can choose when paying for your order. Finally, you can also buy Eve Queen and CA King models on Amazon for the same prices, although you won’t qualify for the 100-night trial. Based on what we’ve learned about Eve’s mattress design and price points, how does this compare to the competition? Alright, now that we have a better idea of how Eve Mattress looks on paper, let’s find out what real-world customers are saying about their experiences. What’s Everyone Saying In Their Eve Mattress Reviews? Eve Mattress had an average customer rating of 4.4 stars on Amazon at the time of our research, based on 100 reviews. There, most compliments seemed to reference improved sleep, high-quality materials, and excellent customer service. What few complaints there were often claimed the mattress was too firm and had a strong odor. From a professional perspective, Eve Mattress had similar ratings on Sleepopolis, Sleep Sherpa, and The Sleep Judge, where it was rated a 6.5-7 on the firmness scale. Most noted its balanced feel, effective pressure relief, and comfort when sleeping in all positions. However, Sleepopolis felt their Eve mattress didn’t offer enough bounce, while Sleep Sherpa liked the bounce it provided, which goes to show how personal preferences can differ (more about this next). Like several Amazon reviewers, The Sleep Judge noted their Eve mattress had a very “undesirable” initial smell, which took about two weeks to complete de-gas. Is Eve Mattress Your Best Option? Ultimately, “best” is a highly subjective word that’s based almost wholly on personal preferences and needs. For example, if you prefer an especially firm or plush mattress, Eve’s middle-of-the-road firmness likely wouldn’t represent your “best” option. Or—at least based on what we learned in the previous section—if you’re looking for a mattress that features the lowest amount of VOCs and least off-gassing, then Eve might not be a “best” choice, either. On the other hand, Eve’s price puts it on the lower end of the spectrum compared to the competition, so if cost is your driving factor, then it certainly deserves a look. Referencing their 3-layer foam design, 100-night trial, and vacuum-sealed shipping, though, they don’t seem much different than competitors. This shouldn’t come as much of a surprise, since we’ve learned that, within the online-only mattress industry, it’s often more about marketing than it is about creating a product that’s meaningfully different than the competition. Pro tip: Perhaps Eve’s biggest differentiating factor is that they’re able to take special orders for custom-sized mattresses, which is something no one else can match. But most importantly, will an Eve mattress help you sleep better? Again, this depends on far too many factors for us to gauge, including your sleeping environment, medical conditions (such as chronic back pain, snoring, arthritis, etc. ), and even things like your pillows. The good news is that Eve has been in business since 2012 and seems to stand behind their mattress with a 100-night trial and 10-year warranty. This way, if you’re not satisfied with your sleeping experience, you won’t be out a single penny. Before buying your next mattress, be sure to learn the best way to shop for a mattress online. 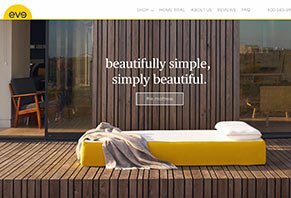 Write a Review for Eve Mattress!